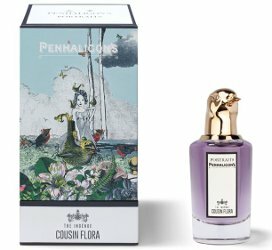 Penhaligon’s has launched The Ingénue Cousin Flora, a new addition to their Portraits collection. Encased in a grandiloquent glass flacon topped with a gold-tone bird stopper, the Ingénue Cousin Flora eau de parfum by Penhaligon's is an invigorating citrus fragrance with woody depths. Announcing its presence with a burst of vivacity and light fresh notes, a woodier story starts to reveal, finishing with the comforting notes of musk. Penhaligon’s The Ingénue Cousin Flora can be found now at Harrods, £190 for 75 ml Eau de Parfum. This sounds good but why would they call it flora if none of the notes are florals?? They are meant to represent people…so “her” name is Cousin Flora. Surprised this series is still alive. Who buys these? I find them expensive, the marketing is unappealing and I dislike the names. Is the line selling well? I tried a few when I was in NYC and they smelt like cheap knock-offs off existing niche scents, one of them being Tobacco Vanille. I posted recently about two longstanding staff members at the May fair shop being amusingly indiscreet when discussing recently discontinued fragrances with me, not long after Puig bought the company. Had the distinct impression the ladies weren’t too keen on the new line, especially as the prices are so much more expensive than previous lines were. It would indeed be interesting to know how well sales are going.